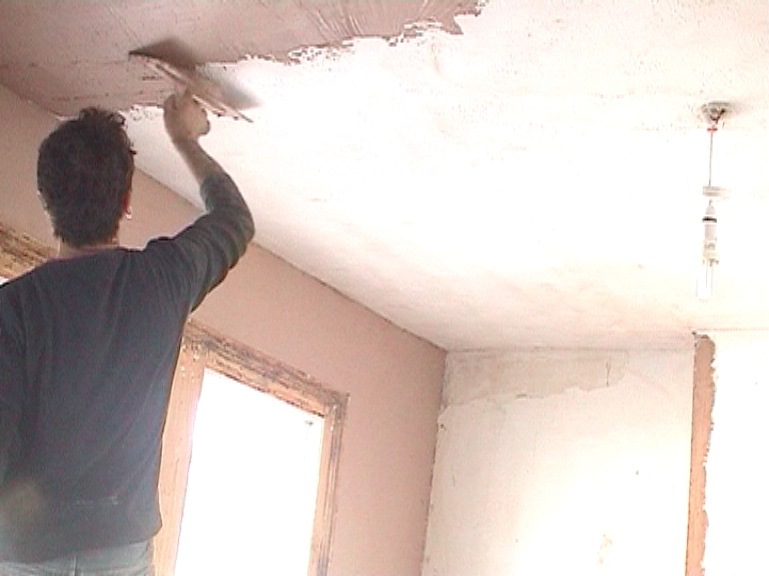 The how to plaster over artex video clip below shows a ceiling - but a wall would use exactly the same method. Plastering over artex is no different to normal plastering - but it is one of the hardest aspects of skimming. First you need to decide if it will be easier to first apply a base coat. If the highest point of the artex is 5-10mm then it will be easier to apply a base coat of 'Bonding Coat' to the surface. The video below shows how to plaster over artex - that has highs of about 5mm, so I chose to not apply a base coat and instead apply two thick coats of finish as normal. However it was borderline as to whether the two coats would cover, in this case it did work but if not a 3rd coat would be needed. The skimming process can then be carried out as normal. PVA had first been applied to the whole ceiling. The ceiling was white, making it difficult to see where I had applied the PVA - so I added a handful of plaster to the PVA dilution to turn it pink. The ceiling had been previously painted with a vinyl paint and was not at all porous, so 1 coat of PVA was sufficient. The first part of the video shows the 1st coat being applied - this is just a quick coat applied to bring the plaster out to the highest points. It will look very rough - but it is pointless in wasting time playing around with it as it will soon all be covered with a second coat. Keep reminding yourself that you have another 5 stages at least - to get it looking better - this first coat is literally to obtain a flatter surface - nothing more. The high points of the artex will still be sticking out - but don't worry too much. The trowel angle will have an effect - the flatter it is the more the plaster will be applied flatter - the more of an angle (the leading edge of the trowel being along way off the wall) the more liable that the highs will protrude. Later on in the video you see the 2nd coat being applied - this is a lot thicker than it would be on a normal surface due to needing to cover all the high points of the artex. It is often when you start this coat that you know if a third coat will be needed. In this case it would have been just as easy to do a 3rd coat, as I was having to put quite a bit on for the second coat, and then being very careful not to scrape it all off by having the wrong angle of my trowel. Notice the trowel angle is quite flat in the video - in order to apply a slightly thicker, flat coat. Once this second has been applied then the troweling stages (3-6) are exactly the same as normal. Water or PVA can be applied to the surface to control the suction. If you do this when it didn't need it - the worse that can happen is the plaster takes longer to firm up. If you don't control the suction when it did need it - the worse that can happen is - disaster - it may all dry and become unworkable too quickly!